BRAUNSCHWEIG, Germany -- Porsche SE said it welcomed the decision on Wednesday by a German regional court to dismiss two investor lawsuits against the holding company alleging market manipulation involving Volkswagen shares. The company pledged to fight remaining legal cases "with all rigor," a spokesman said. This is a positive signal," Porsche SE spokesman Albrecht Bamler told reporters at the court in Braunschweig, northern Germany. The court dismissed two investor lawsuits claiming 4.7 million euros ($6.14 million) of damages from Porsche SE for alleged market manipulation. Various lawsuits have been filed against the company in Germany and the United States by hedge funds and have yet to conclude. German and U.S. investors accuse the company of having concealed a move in 2008 to acquire VW and of secretly amassing a majority stake in Europe's biggest carmaker. 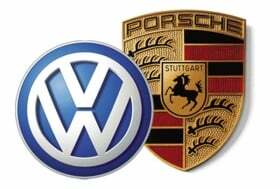 Porsche SE disclosed on Oct. 26, 2008, that it controlled 74.1 percent of VW, partly through options, and was seeking to acquire 75 percent and eventually a takeover. The announcement caused VW's stock to surge as short sellers raced to buy shares borrowed in a bet that VW would fall. Three additional suits, which seek a combined total of 4.1 billion euros, are still pending at the court. Porsche SE racked up more than 10 billion euros in debt in its failed attempt to gain control of Volkswagen, forcing it to abandon its efforts and instead sell a 49.9 percent stake in Porsche AG to VW for 3.9 billion euros in December 2009. Last month, Volkswagen bought the remaining 50.1 percent stake in the sports car maker which it did not already own for almost 4.5 billion euros ($5.8 billion), concluding years of efforts to combine the two automakers. Last week, a German markets regulator dropped its investigation into whether Porsche SE violated disclosure rules when it informed shareholders in July about selling the sports car business to Volkswagen. BaFin had investigated Porsche for market manipulation and passed on its findings to prosecutors in Stuttgart. Porsche SE stock has gained 9.7 percent this year, valuing the German company at 13.9 billion euros. "It's good news," said Juergen Pieper, a Frankfurt-based Bankhaus Metzler analyst. "It now looks probable that Porsche will ultimately not have to pay anything. Analysts expect penalties of between half a billion euros and maybe 4 billion euros, and if there is now a sign that things could be less serious or maybe no penalty at all, it's certainly good news."